At the start of the 70s, light-sensitive electronics (photoconductive cell or LDR - light-dependent resistor) were still fairly new. Manufacturers of these components were looking for new ways to apply them, thus extending their customer base. Sharp was one of the companies that produced them, and one of their sales staff, Masayuki Uemura, visited Nintendo and met with Gunpei Yokoi. Not only did this meeting result in a series of new toys, but Mr. Uemura eventually moved over to Nintendo where he came to head up one of the hardware design groups. Sharp’s LDR would be used in the light-beam series called Kôsenjû SP (光線銃SP): toy guns that emitted a short flash of light when 'fired' and targets equipped with a sensor that would register the light (when aimed correctly) and show the hit in various fashions. The SP gun had a white handle. The Custom gun handle is black. When hit by the light-beam, the Jumping Bottle target would spring into two parts, held together by an electromagnet until hit by the light from the gun. Other targets included a roulette that would spin, a lion that would roar and wildlife scenes with exotic birds or animals of prey (Electro Bird and Electro Safari) collapsing upon each hit. All guns and targets are battery operated. With this series, introduced in 1970, Nintendo created something for the entire family: to be enjoyed by children and adults together (well, fathers and their sons, probably). Around this time, electronic games started to become mainstream, even though the retail prices were still considerable, ranging from ¥980 to ¥2,500 for gun and rifle, and between ¥2,500 and ¥5,900 for the individual targets. These prices notwithstanding, Nintendo had another blockbuster on its hands, selling into the hundreds of thousands of the various guns and targets. 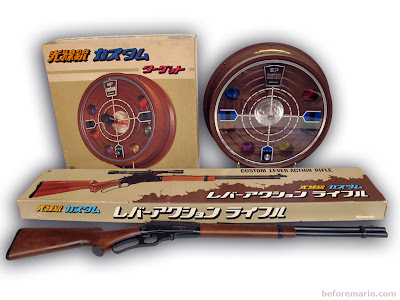 These toys are amongst the first (if not the first) commercially available light-guns for home use, although less sophisticated than the subsequent video game light-guns that work together with a TV screen (the Magnavox Odyssey rifle being the first one of these, released in 1972). 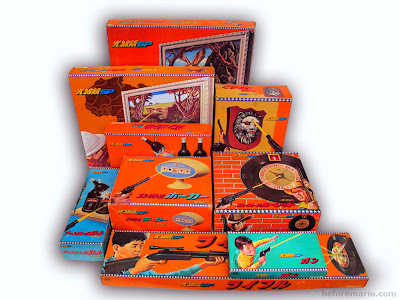 A second series of light-gun toys was introduced in 1971, called Kôsenjû Custom (光線銃 カスタム), consisting of a very realistic looking rifle made from wood-like plastic and metal (Custom Lever Action Rifle, ¥14,000) and a new target (Custom Target, ¥7,800). These were clearly aimed at older children and adults. In 1976 the Kôsenjû Custom series was rejuvenated with two great new targets: Custom Gunman and Custom Lion. These were sold loose for ¥5,000, as well as in sets with target and gun for ¥7,500. As the name suggests, these feature a gunman or lion that would collapse dramatically when hit. After a short time lying dead, by means of a clever mechanism inside the toy, they would automatically spring back to life, ready to take the next shot. For more information on the various items in the Kôsenjû series, check out the following posts: Electro Safari & Electro Bird, Jumping Bottle, Electro Poker, Custom Gunman and Custom Lion, Guns and Rifles and Custom Lever Action Rifle. Excellent post, thanks for putting this up! I love the picture at the top with all the boxes, they look really great. @Brijmohan: thank you for the feedback. Always good to hear the work is appreciated. Good point, and you are probably right. I will check one of these toys to make sure.